Dorking-based sound engineer Gilderoy (Toby Jones) is unexpectedly asked to work on a violent Italian horror film in the 1970s in Peter Strickland's follow-up to his debut feature, 'Katalin Varga'. This psychological thriller has had the critics purring but audiences may find themselves more befuddled than entranced. 'Berberian Sound Studio' pays homage to the Italian giallo films of the 70s, particularly with a finely executed replication of a period opening credits scene for the film Gilderoy finds himself working on. With a background less than suited to horror, Gilderoy is surprised to discover the violent nature of 'The Equestrian Vortex' - a film involving penetration by red hot poker, human sacrifice, and much more. It is easy to reflect on the profound effect of cinema on a viewer - we wouldn't revisit our local picturehouse if there wasn't such an effect. 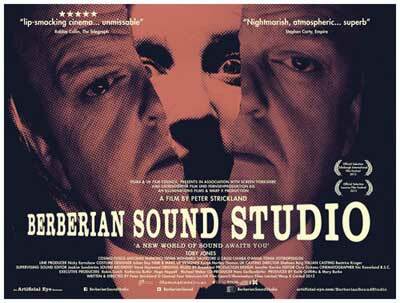 'Berberian Sound Studio' examines the internal effect of filmmaking as Gilderoy's work consumes him to the detriment of his psychological health. The film's pacing and reception echo films like 'The Tree Of Life' 'Tinker Tailor Soldier Spy' (also featuring Jones) - slow burners which resonated more with critics than regular audiences. The same is expected here, albeit with clever flourishes such as the appearance of a "dangerously aroused goblin" and the intense focus on the art of foley which sustain interest. Toby Jones is as accomplished as ever but Strickland's efforts ultimately feel more like an exercise in filmmaking, and by the film's curious final third and abrupt finale, a deliberately obtuse exercise. 'Berberian Sound Studio' is out on limited release in UK cinemas.